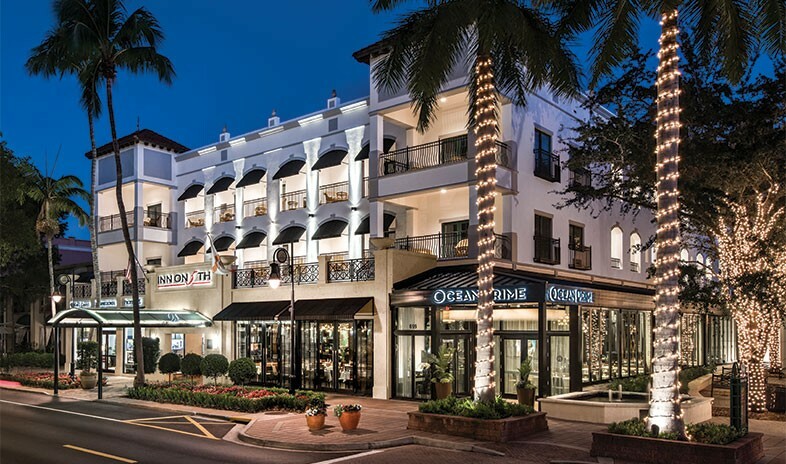 With a prime location in the vibrant heart of Naples, Florida, the Forbes-rated, privately owned Inn on Fifth combines relaxed elegance and unpretentious sophistication on Fifth Avenue, one of Florida’s most fashionable arts, shopping, and dining destinations. The property matches the allure of its surroundings with a distinctive, contemporary style mixed with vintage tradition. An air of Old World charm and warmth radiates from the white marble lobby to each of the 119 richly appointed accommodations. These include 32 Club Level Suites, whose expanded services and amenities make them ideal for small executive groups. Two magnificent Presidential Suites that are fit for royalty or CEOs complete the mix. Meeting venues range from ballrooms and executive boardrooms to a landscaped rooftop pool deck and Fifth Avenue Terrace overlooking the local dining and entertainment scene. Dedicated catering and conference service managers ensure undivided attention for every group and perfection in every detail. Guests feast on seafood, sushi, steaks, and cocktails at Ocean Prime restaurant and Truluck’s Seafood, Steak & Crab House. They work out at the hotel’s fitness center and indulge in massages and treatments at its Spa on Fifth. Off-site, they choose from nearly 1,600 holes of golf in the area, face off on a dozen tennis courts behind the hotel, stroll to Gordon River for boating and waterfront dining, or simply lounge on Naples’ legendary beach.